I don't know why, but during the last few days I have been reflecting on my youth. Maybe its due to a renewed sense of our own mortality, but that's a bit morbid. Perhaps it's simply a reflection on a life that is past, and the desire to enjoy what was good about it. Whatever the reason, a Blog is an ideal tool to engage in a bit of self-indulgence, and to remember a time when I was fit and active. So here goes on my football career (career is used in the loosest possible sense). For as long as I can remember I had a passion for football. I was brought up on a small holding outside a village in North Wales where there was plenty of space to kick a ball about, and we lived there until I was 11. 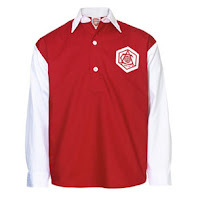 At about the age of 5 or 6 I was given an Arsenal shirt - I have no idea why Arsenal, as Liverpool was the closest big team to where we lived. Over the next few years of my development, I would practice in the fields with my sister reluctantly going in goal. You can tell how scarred she was by this, as over 50 years later she still talks about it. At the age of 11 we left the small holding, as my Father had died, and moved into the village (Penycae). At the same time I left the local Primary School and moved to Grango Secondary Modern School in the next village of Rhosllanerchrugog. I hated almost every moment of my four years there, except for playing football. 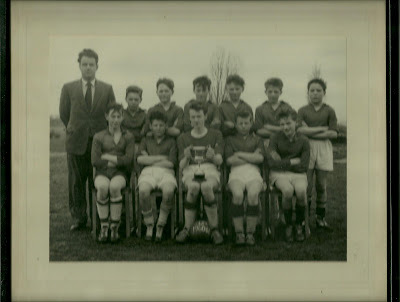 During my second year, I was selected to play in the school team, and stayed there until I left school. I always played at right back, and even if I have to say it myself, I was pretty good - not good enough to make a living out of it, but good enough for amateur enjoyment. This photograph shows me in the back row next to the sports master (yes I know, the small one, but I was still a bit bigger than Lionel Messi and Diego Maradona, and they haven't done too badly). I came alive on a football field, it was my life. Though small, I was fast and fearless, with good technique inspite of the quagmire pitches and laced up leather ball that got heavier and heavier in muddy weather. The school team won the under 13 schools cup in 1961, and also two years later just before I left school to begin work. In the village of Penycae there was a small recreation ground which was always known as The Rec. Every hour outside of school and school work was spent at The Rec playing football. The boy who owned a football was never short of friends. If he was not able to come out that day, I was always the one chosen to go to his mother and ask, "can we borrow John's football please?" It was then my responsibility to get it back. A few months before leaving school I was selected to join a football team from the Wrexham area, and play in a youth tournament in Holland. This was at Easter 1963, and there were teams there from Belgium, Germany, Holland, England and Wales. We were one of the youngest teams there, and some were almost semi-professional. We did well, coming top of the teams who were totally amateur, and had special mention for fair play, which given the record of one or two of the team was quite remarkable. To be honest, looking back nearly 50 years, I can't remember much about the football or Holland, except for some reason we were taken on a tour of the Tulip fields, as well as a canal boat trip. The latter would have been OK, but looking at Tulips? I'm sure that they meant well though. On leaving school I spent the next five years in one of the crappiest engineering firms in the area, serving my apprenticeship as a Centre Lathe Turner. 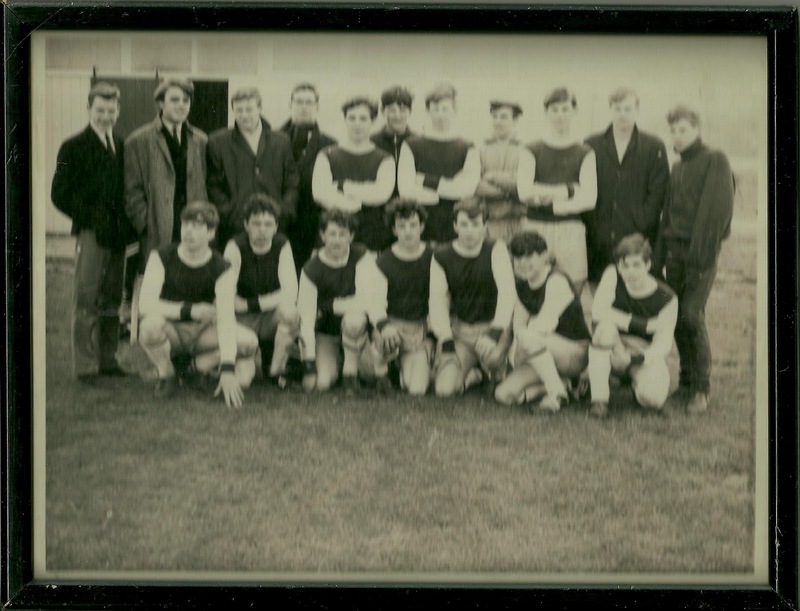 I continued to play football every Saturday for a number of local teams, and even ran the village team for a while - selecting the team, collecting subs, booking the pitches and mini bus as well as sending off statistics and reports. In footballing terms this was not a great team, but all I cared about was playing. My Mum would always ask how I got on today. On occasions I would be able to say that we only lost by 6 goals instead of the usual 10. Success is relative isn't it? On occasions I would be asked to play for a local team in the Welsh National League Division Three. This was a definite step up in profile, but the games were brutal, and I was often grateful to be fast and fleet of foot to get out of the way of players who thought that the ball was not necessary to their enjoyment. One of the highlights with a village team was playing a cup final at The Racecourse Ground, Wrexham. There were about 18 spectators, and 12 were supporting me. We lost 2-1. I've also lost the medal. The picture below is one of the teams I played for, but I can't remember which one. After serving my apprenticeship, I moved to Birmingham for two years and worked for Newey and Eyre in the south of the City. They had a works football team which I joined. We trained two nights a week after work and played in a works league every Saturday. I have never been fitter or happier playing football. 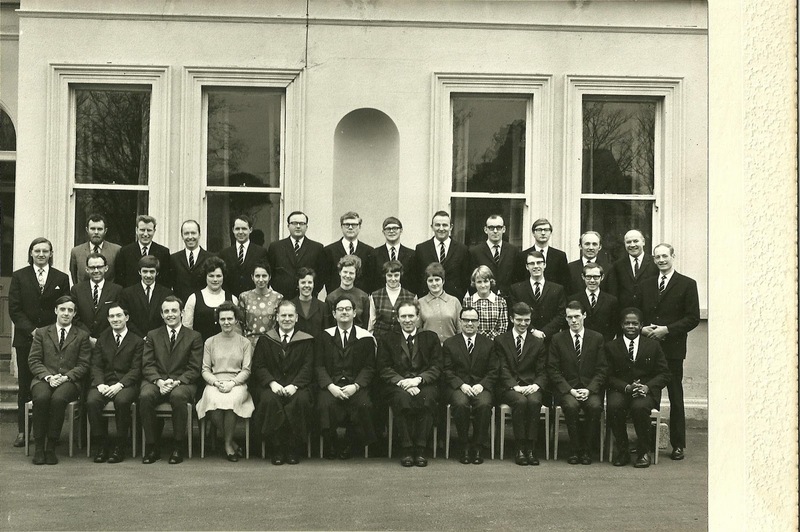 In 1970 a life change saw my wife and I move to Belfast where I studied Theology at the Belfast Baptist College. I don't remember much about the entrance interview except the Principal asking me do I play football. I believe to this day that I was accepted on the basis of answering yes. Apparently the Baptist College had not beaten the Methodist College for many years, and it was the Principal's desire to change that. Forget about Christian spirit and standards. The first game against the Methodists was one of the roughest I'd played in. They had a left back with a nickname of The Bull. He was huge and totally un-coordinated. As I played right back, we collided often. We won, to the delight of the Principal, but I hung up my boots in a fit of righteous indignation. What a way to give up football. Behaviour on the pitch by students of Theological Colleges was worse than that displayed in Welsh National League Division Three. 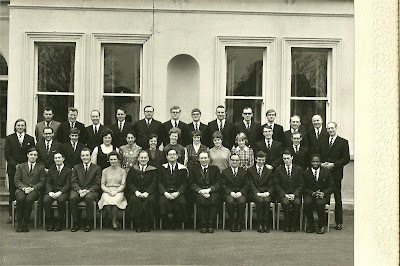 Looking at the photograph below of the college in my first year, you wouldn't think there was a footballer among us would you? So my football journey began at aged 5, and ended at age 24. There were some successes, but always there was enjoyment. I was good, but not really good, and that was good enough for me. You don't always have to be a winner in life; enjoying what you do is success in itself. Enough of this self-indulgence, it's time for tea.